hotel.DRINK-Water scarcity area . Own bottle water for drinking purposes is advisable arrangement.TRANSPORT-Auto rickshaw.and horsecarts are available as reserve conveyance for local movement from Bhabhua. In the inscription . But only 15 lines could be read and correctly interpreted.Historian Prof RD Banarji concluded establishment of temple in 636 AD.Where as NG Majumdar kept the date at 348 to 349. While D R Bhandarkar kept it before 4th centuryA D.
Lie in the centre with four mouth Mundeshwari is in the Eastern wallet.Ganesh in the north. OTHER SITE-1There is an Archaeological museum to visit at. 2.Nearby two armed Chandeshwari temple. 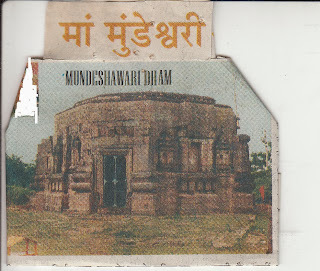 was formerly a temple of lord Vishnu.But latter on during time of Chero dynasty god in the name of Mandleshwar was started being worshipped along with his wife Mandaleshwary ,as kuldevi of the Chero dynasty.This later on became Mundeshwary.